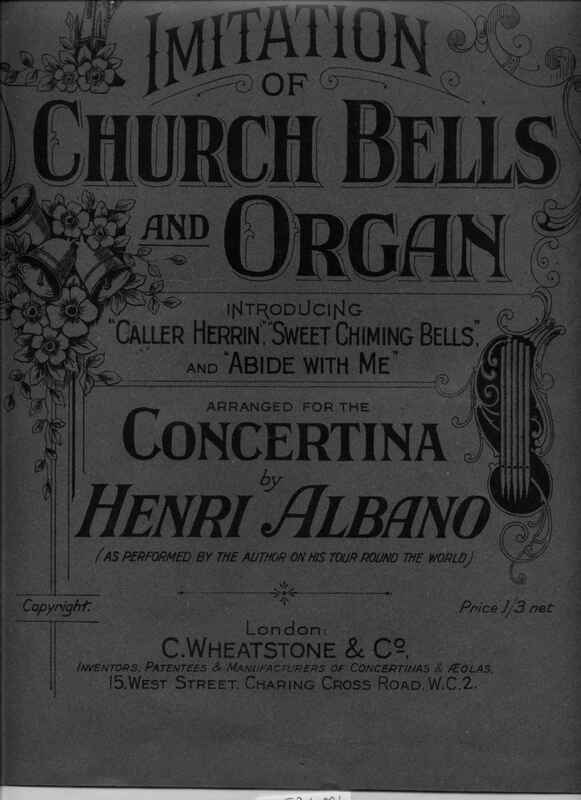 Full Description: A large folio of “Imitation of Church Bells and Organ, arranged for the concertina by Henri Albano”, published by C. Wheatstone & Co, 15 West Street, Serial No 2460. An important piece in the popularisation of the concertina, which was still being played with great gusto by senior players in the 1960s and ‘70s. Also on the cover “as played by the Author on his tour around the world”. 250 x 355mm. Dr Allan Atlas’s Paper on this piece of music was published in the Free Reed Journal, 3 (2001) 108-112 [http://www.concertina.com/atlas/atlas-church-bells.pdf ]. For a signed post card of Henri Albano, see NC.3.2.1.1-032 [http://www.concertinamuseum.com/NC3020101-032.htm] for a postcard of Albano posed with six of his instruments.